Embrace the spirit of Christmas by giving back to the environment this festive season. If ever there is a time for excess, Christmas is it. But it’s important not to forget about the waste you create amidst all the good times, feasting, gifts and celebrations. You’ve heard of the 12 days of Christmas, but here’s 12 ways to avoid waste this Christmas. Turning your house into a light display come the festive season is a great way to spread Christmas cheer, but also to use a lot of electricity. Consider solar-powered Christmas lights instead – our long summer days are perfect to charge them so your house can shine at night. Think green when it comes to your tree. Either invest in a top-quality fake tree which will last many years, or buy a real tree. If you do opt for a real tree, make sure you recycle it properly. Small trees can be cut up and recycled in your garden waste bin, while many councils schedule a special collection for larger Christmas trees. Buying cheap gifts that only last a short time can be great for the family budget but not so good for the environment. Instead look for well-made gifts, which will last and offer good value for money. To further minimise your footprint, give experiences rather than physical gifts. In a world where time is a priceless commodity, making – rather than buying – gifts can be a whole lot more meaningful and lead to less consumption. For another spin on this, give the gift of time – offer to do some free babysitting or to mow a friend’s lawn. When buying physical gifts, many stores now offer gift receipts, which enable the recipient to exchange the present without revealing the price. Providing you don’t get offended, it’s a win-win – your gift doesn’t end up in the landfill and your loved one gets something they truly want. Remember your e-footprint and try to avoid buying gifts that need batteries. If you do buy something that’s battery-operated, consider making rechargeable batteries and a charger part of the gift. Trust us, they’ll thank you. If you receive a gift you don’t like, consider whether you can upcycle it, or use it for another purpose. If that’s not possible, donate it to charity or consider re-gifting it, rather than throwing it out. Re-gifting may have a bad reputation but you can’t argue with its environmental credentials. Instead of opting for store-bought wrapping paper, make your own, use your kids’ drawings or dress up newspaper with festive ribbon. And when you’re done, consider recycling your wrapping or consider reusing it – you can refresh it by covering with a towel and ironing out the creases on low heat. Avoid unnecessary food waste by buying your food as fresh as possible so that it lasts longer and you throw less away. You can also reduce your food miles and carbon footprint by buying it locally. Buy food you like and will eat. It may seem like simple advice but as Christmas is associated with many traditional dishes, who hasn’t served up a plum pudding when everyone would have rather had a pavlova? Or if you and your guests aren’t big turkey fans, avoid the food waste and go for chicken instead. The only rule of Christmas should be to enjoy! There are numerous blogposts and articles dedicated to creative ways to use up Christmas leftovers. And when you reach the point that you just can’t consume any more ham or turkey, instead of throwing it away, freeze the rest and use it when the memory of Christmas has faded a bit. When catering for a crowd, it can be tempting to opt for disposable plates and cutlery to save time on cleaning up. But for the environment’s sake, use crockery and get everyone to pitch in with the washing up instead. And remember to recycle your glass bottles that were once full of Christmas cheer! Some ways to manage your money and your time this festive season. You wake up on Boxing Day and stumble into the lounge room to face what looks like…Armageddon. There’s wrapping paper strewn all over the floor, every surface is covered with toys and knick-knacks that seemed like a good idea at the time and the recycling bin is already choc-a-block full of packaging. Your head a little fuzzy from the second bottle of Tassie sparkling, you stumble over to the kitchen and open the fridge. Things don’t get any better. The second pavlova with today’s use-by date has hardly been touched, the fridge shelves can barely accommodate the leftover meats and you’re not sure how you’re going to get through all that extra seafood. Half of this will have to go. Switching on the kettle, you check your phone only to find an unwelcome automated email from the bank. Apparently all that last-minute shopping maxed out your credit card and repayments are due to start shortly. A nice cool shower will help shake the Tassie sparkling out of your system. But you have a sinking suspicion the rest of your Christmas hangover will take a little longer to recover from. If this sounds familiar and your memories of last Christmas are clouded by nagging feelings of guilt over the waste and excess—not to mention the lingering credit card bill—you’re not alone. Last Christmas Australians planned to spend an average of $955 over the festive season. We were left with an average credit card debt of $1,666. And almost one in five of us failed to pay off our Christmas debt in six months1. So it’s not surprising that more than three out of four Australians are looking cutting costs this Christmas. 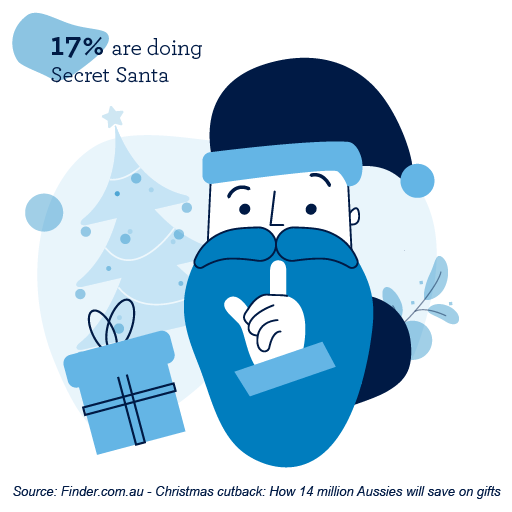 And 15% say they won’t buy presents at all2! OK, so going the full Grinch could be a little extreme. But this Christmas could be time to do things a little differently. It’s not about being a Scrooge, it’s about being more aware of the impact of your choices on the environment and your hip pocket. While giving (and receiving) gifts and enjoying a special meal with friends and family are wonderful parts of Christmas, there are ways of doing it more mindfully this year…and waking up with less of a financial hangover. Choose thoughtful but modest gifts such as handmade items, home-cooked meals or plants for the garden. Go for experiences rather than stuff to reduce waste—massage vouchers, wine tours or a visit to the zoo. It doesn’t have to be super expensive, a picnic in the park or a family day out to the beach can provide wonderful Christmas memories without needing to break the bank. Take advantage of sale periods and stockpile gifts to help your money go further and spread the cost of Christmas throughout the year. Try leaving the credit card at home and only spend what you have by using cash or a debit card. Being more mindful isn’t just about how you spend your money. It’s also about how you spend your time. Now, you don’t want to feel guilty over Christmas and New Year. After all, it’s important to celebrate the year that’s gone with friends and family. But it is worth taking a moment to think about less fortunate people in your community. Not everyone has a network of family and friends to enjoy the festive season, or the money to help things go with a swing. So if you have time, why not think about helping others. You could volunteer at a food shelter—check out Volunteering Australia, Meals on Wheels or The Smith Family. You could spend time at a retirement village helping senior Australians by reading or accompanying them on walks. You could donate items of food to the less fortunate—Foodbank agencies feed 652,000 Australians every month, including 216,000 children3. And you never know, by helping others you could help yourself come closer to the true meaning of Christmas. With comprehensive credit reporting now common, tightening lending practices and open banking set to come in next year, the landscape of applying for finance is rapidly changing. Nest Egg spoke with an established mortgage broker to find out how consumers’ spending habits can impact their capacity to access finance. Never before has the details of consumers’ spending been so accessible for lenders, as our spending habits increasingly shift towards electronic payments. With the RBA predicting last week that cash will soon be a “niche” payment method, it seems this trajectory is only set to continue to the point that the entirety of our spending occurs via online transactions. Nicole Cannon, founder and director of Pink Finance, says this will have far-reaching implications for those looking to acquire finance. “You need to be aware that in this Big Brother world, everything is being recorded and we can’t not consider that,” says Nicole Cannon. As a Sydney-based mortgage broker since 2002, she says banks and lenders are increasingly looking at every aspect of daily spending through trail left behind by online transactions. “In this day and age where everything is just a tap, people actually do really lose their sense of value for money,” she says. While Ms Cannon acknowledges that increased discretionary spending, or spending on everyday luxuries, is often the result of circumstances, she says it is important for consumers to realise that banks may increasingly look at such expenses to determine the desirability of a loan applicant as the regulatory climate sees lending tighten. “The banks are being overly cautious, I think, but we have to adhere to that,” she says. With the advent of “open banking”, which will allow banks unprecedented insight into consumers’ financial data, she says this scrutiny of everyday living expenses, from your car loans to your UberEats bills, is likely to increase. “I think there will be [increased scrutiny], as there’s just going to be more transparency with the conduct of any style of bank account,” she says. Ms Cannon says it is common for her clients, regardless of their net worth, to be unaware of the amounts they are spending on the little things. “Whenever I sit down with customers and do a review, regardless of their level of income, most are shocked when they see what they’re spending,” she says. As open banking comes into effect, she says it will be more important than ever for consumers seeking credit to make their repayments on time. “If you’re late constantly, or waiting for an SMS to remind you, that will start to have a detrimental effect,” Ms Cannon says. Finally, Ms Cannon says it is important to find a mortgage broker that understands your spending can fluctuate dependent on current circumstances and will seek out a loan provider that look beyond the six-month savings statements prior to the application for the loan. “I think there needs to be a bit of a buffer and understanding that just because they’re spending ‘x’ pre-loan, doesn’t mean it’s going to be the same post-loan,” she says. https://www.tdls.com.au/wp-content/uploads/2018/12/black-board-image.jpg 700 1050 The Webmaster https://www.tdls.com.au/wp-content/uploads/2016/10/tls-logo-1.png The Webmaster2018-12-06 22:40:122018-12-06 22:44:05How do you score on money basics? Protect yourself from identity theft on social media. Social media platforms allow us to stay connected to family and friends that we don’t get to see every day, but they also allow hackers and identity thieves to gain access to our personal information. In the last few years, there has been a rise in identity theft cases that started from social media platforms. When people start sharing information with the public, it can open up doors for the information to be used against them. Details like full name, date of birth, hometown and even school locations and dates of graduation can become dangerous in the wrong hands. Social media platforms typically require your name and your date of birth, but most platforms will give you the option to not make the information shareable. Beyond basic information, be careful about what you post. Of course, you should not share your debit/credit card and social security numbers with people online, but images can be dangerous, too. A few examples would be things like posting a picture of your new car and not covering your license plate number or sharing event details that contain your home address. If these get in the hands of someone you don’t know, that person could use the information to steal your identity. Restrict application permissions to your social media accounts. When you download a new application that gives you the option to log in with a social media platform instead of using an email address, you are giving the app the rights to your information that has been collected on the platform. You might not think anything of it or that it would impact you in a negative way, but as we saw with the Cambridge Analytica data scandal, third parties have been able to gain access to information on social media users without their knowledge. Use careful consideration when granting access to any application, regardless of its stated intent. Even if the app itself is benign, a hack or data breach could leave your personal information out in the open. And the more applications your social channels are linked to, the more vulnerable your information is to being hacked and used inappropriately. Make sure to review the settings on your social media accounts, including the permissions for apps, and delete applications that you no longer use. Changes to websites and applications happen often, and it is never a bad idea to monitor the security functions on different platforms to ensure that your information is protected. You should have a clear understanding of what the default security settings are and how to change them so that information is only shared with the audience you choose. Many people are surprised when they learn how broadly visible their information is by default on social media; you don’t want to be caught unaware when your personal information is at stake. In addition to security functions, you should consider changing your password frequently and avoid using the same password across different accounts. A rogue hacker tweeting from your profile might not make you sweat, but what if that person then also had access to your bank accounts and healthcare data? If someone was able to gain access to an account with a shared password, they will have a lot of information about you that they can use to steal your identity. Before you start shutting down all social media platforms because of fear of identity theft, there are a few more things that you can start doing now to protect yourself. Only follow or friend people that you know, and be mindful of what you post and share. When accessing accounts in public spaces, make sure to log out when finished and delete any browsing history. Lastly, never give out your social security or credit card number to any person or business unless it is legally mandatory (as with an employer for tax purposes or when applying for certain federal benefits). Identity theft is something that individuals should be vigilant about, but it doesn’t need to be a burden. Keep best practices in mind so you can still enjoy the positive benefits of social media and protect your information from the bad guys. https://www.tdls.com.au/wp-content/uploads/2018/11/cyber-safety.jpg 4923 3282 The Webmaster https://www.tdls.com.au/wp-content/uploads/2016/10/tls-logo-1.png The Webmaster2018-12-05 00:02:512018-12-05 00:05:46Protect yourself from identity theft on social media.